Our Royal Jelly (in honey) with Bee Pollen and Propolis is blended to a creamy consistency and is packed with vitamins, minerals and nutrients from the bee hive. 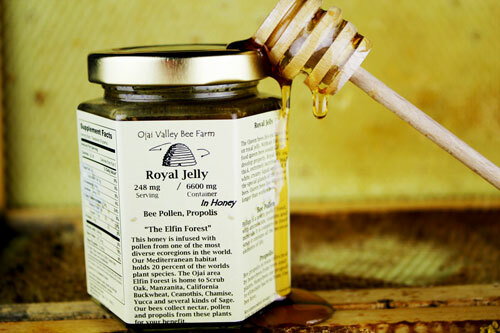 Since honey is a natural preservative our Royal Jelly (in honey) does not need to be refrigerated. The reason that honey doesn't need to be refrigerated and is the only natural food that does not spoil is because of it's high osmolarity. The high osmolarity of honey kills bacteria and fungi by drawing water from their cells. 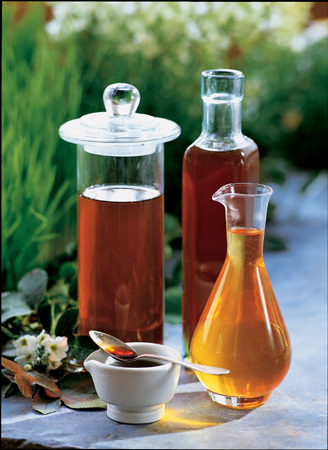 Honey is also very acidic, which inhibits bacteria growth as well. The Queen bees live exclusively on royal jelly. Without this special food queen bees would fail to develop properly. Royal jelly is a thick extremely nutritious, milky-white creamy liquid secreted by the special glands of the nurse bees. Queen bees live 40 times longer than worker bees. Although royal jelly has traditionally been known to prolong youthfulness and improve skin beauty, evidence indicates that this substance increases energy, alleviates anxiety, sleeplessness, moodiness, memory loss, and bolsters the immune system. The honey in this jar comes from one of the most diverse eco-regions in the world. Our Mediterranean habitat holds 20 percent of the worlds plant species. The Ojai area Elfin Forest is home to scrub oak, manzanita, California buckwheat, ceanothis, chamise, yucca and several kinds of sage. Our bees collect nectar. pollen, and propolis from these plants for your benifit. 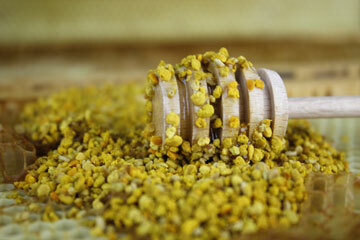 Pollen is a nearly perfect food, with amino acids, vitamins and minerals. It is complete in itself since it contains all the necessary elements of life. Bee propolis has blood cleansing properties and has the ability to sweep away harmful bacteria. The Queen Bee enjoys many miraculous advantages over the ordinary bees of the hive. The Queen live for six to seven years; the workers die exhausted in six to seven weeks. The Queen is the only member of the hive able to mate and reproduce the species; the worker bees are sexless. The Queen lays eggs weighing more than her own body weight everyday, and incredible feat. The Queen is of superior beauty, size, strength and ability. Her superior characteristics are visible to the naked eye. 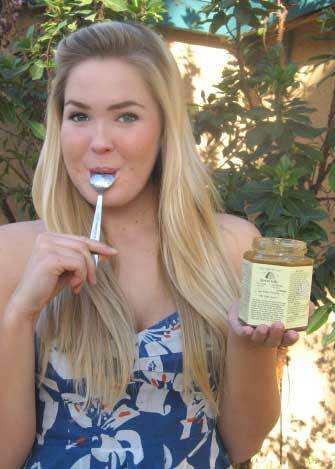 It is Royal Jelly which sets the Queen Bee apart from the sexless workers of the hive. It is royal jelly which enables the Queen Bee alone of all the bees in the hive to mate and reproduce. It is royal jelly which transforms the Queen Bee into such a superior specimen. And it is royal jelly which dramatically extends her natural lifespan. Physicians ministering to the maharajahs and maharanees of ancient India dispensed royal jelly to insure fertility and continuation of the royal lineage. Oriental potentates relied on royal jelly for its magical power to rekindle exhausted sexual desires and restore lost potency. The fabled ability of royal jelly to dramatically rejuvenate the body and extend the lifespan was once known only to royalty and others of great wealth.